Hotel Sofitel Berlin Kurfuerstendamm. Book online now! 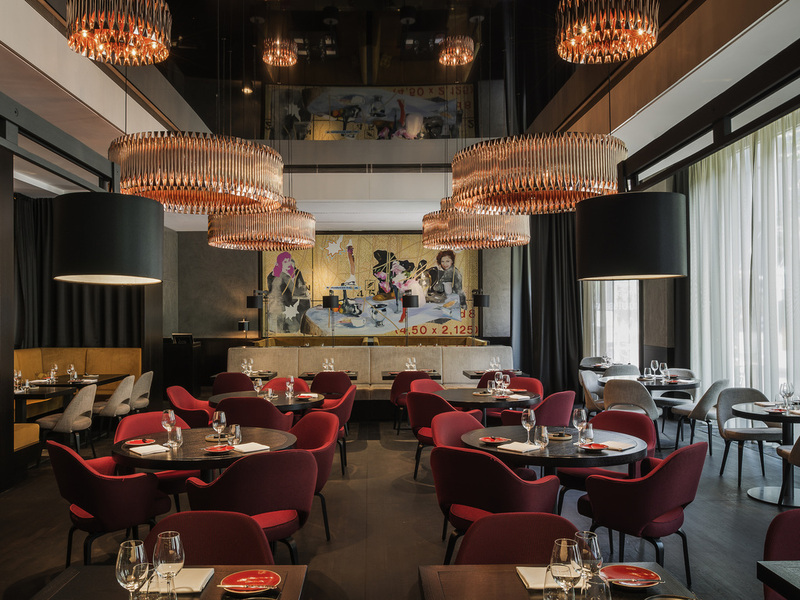 You'll love the Bauhaus-inspired interior and modern cuisine at the Le Faubourg. Enjoy lunch or dinner made with the best regional ingredients; you can opt for classic French style or a French dish with a modern twist. Natural light flows through the panoramic window in the hotel's breakfast restaurant, where you can enjoy a superb hot and cold buffet with omelets, waffles, crêpes, 40 tea varieties, freshly squeezed fruit juices, sparkling wine and smoothies. Discover innovative cocktails in this stylish bar, which hosts DJ sets at weekends. The elegant furniture and subtle lighting make this bar the ideal place for a quick snack, after-work drinks or a glass of champagne. I used to stay in the Swissotel Berlin for many years. I tried Sofitel Berlin which is across the street where Swissotel was. I had a very nice room and was looked after in a very friendly way. Good choice for your stays in Berlin. A great location and really helpful staff. Suggestions and directions were generous and the concierge wonderful. Rooms well serviced and the breakfast and meals available were excellent and served by well trained staff. Location of the hotel is very convenient, the rooms are big and comfortable - the key asset in Sofitel Kurfurstendamm is definitely its staff. Lovely, efficient, wonderful people! I loved the big room, where you can work easily sitting at the desk or sitting on the sofa. I went to the fitness every morning, it is well equipped and was super clean. The staff is incredibly helpful and proactive. The breakfast and lunch service for my conference was the best I've had. Both quality of food and variety/options. I would like to give a special commendation to the concierge Tony. He was very helpful and patient. I received recommendations to 2 restaurants, and reservations made, for Leibniz-Klause and Louis Laurent. My group and I were very pleased and Tony was wonderful. Please thank him for me!! Very pleasant experience, friendly staff and the food was delicious. I attended a conference and the facilities were excellent. The only thing I would mention was that it was not 100% clear to me which extras I would need to pay for in the room and which were complementary. Great stay, happy to return. Had a huge room that was well stocked, modern and comfortable. The desk light was not working, but that was the only slight negative on my stay at the Sofitel Berlin. GREAT LOCATION. GOOD BREAKFAST. OVERALL A DECENT ROOM, BUT THERE ARE COMMENTS. We had a lovely stay at Sofitel Kurfürstendamm! The hotel is well located, the rooms are spacious and very clean and the staff is very polite and helpful! In my next trip to Berlin I will certainly choose it again! Highly recommended either for couples or for families! The reception was full of smiles. The stay was wonderful. A team that always advises and provides service with joy, patience and professionalism. Spacious room, very comfortable bed. A huge and luxurious shower. In general we really enjoyed our stay at the hotel. Two points that I would like to raise: 1) at a five star SOFITEL hotel it is truly expected to have a “turn down” service automatically, without being required to request such a service. After the first night we understood, that such a service was not provided. We asked at the reception, and they wrote a notice that we would like to have such a service. This service was provided only one time during the second night, but not during the following nights. 2. We have placed several used shampoo and shower gel bottles on the bathroom floor on our second day of stay. These were not thrown during the following days, and we were wondering perhaps the bathroom was not cleaned. It was very enjoyable. Your hard work makes our hollidays so much easier. All of your staff is so friendly and extremely professional. Special thanks to the cook who was on breakfast duty on tuesday morning. I was at the hotel for 2 weeks for work. Such business trips need somewhere to return to relax and recuperate. This trip was a great success and the hotel truly helped. Not only could I unwind but I could continue my work in an appropriate and conducive setting. Well done and thanks to the team. The only niggle is that one of the air-con units in my room was sometimes loud. Great stay, too short ! I was staying at the Prestige Suite; a beautifully appointed suite with a huge amount of space. The staff were professional and very attentive. The hotel restaurant is first class. Stay was good, and people accomodating. I did not appreciate being contacted in French for the questionnaire, just because i live in Belgium.the languagues i used to accomodate your colleagues were German and English, so I would have expected to be contacted innthose languages. Just a cultural remark. Very comfortable. It's a beautiful hotel and the staff was very hospitable. As usual, everything was at the top level. The hotel is very well located, has great and modern facilities. However, what makes your every stay pleasant, relaxed and very memorable is its staff: very friendly, professional and willing to help! This time my special thanks go to the porter who helped me during the fire alarm issue. This hotel is located in a very exciting area,it is close to many attractions, shopping and restaurants. The hotel is very spacious,Le Faubourg restaurant is very beautifully decorated, its food is very good, staff are very professional. My room is very clean, bright and spacious.The bed is very comfortable, I recognize Sofitel standard. I personally think the interior details (photos,lamps) are lacking of flow. It is unfortunate because the room is so spacious,it should be more exciting. Staff at the hotel are very helpful, polite and professional.